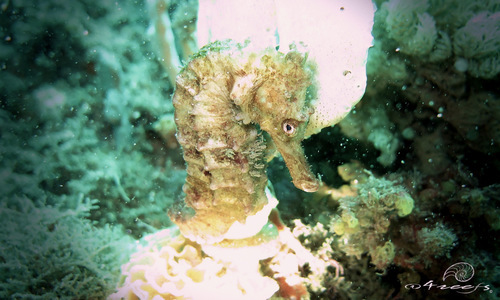 The October's highlighted observation is of the great seahorse (Hippocampus kelloggi), submitted by iSeahorse user Damaris Torres-Pulliza (@4reefs). Describing this picture as great is a bit of an understatement, actually - Project Seahorse biologist Lily Stanton said it reminded her of the famous Botticelli painting -The Birth of Venus ! This shot was snapped near New South Wales, Australia, a region whose waters were only recently discovered to house great seahorses. In fact, Dr Dave Harasti recently published on H. kelloggi’s range moving southwards to include Australia. Harasti also published a paper in 2015 stating that the thorny seahorse (H. histrix), a typically tropical species, had been seen swimming on numerous occasions around Port Stephens, Australia. Other species are suspected to follow a similar pattern of shifting towards the poles in the wake of warming oceans. It is important to glean information about changing population distributions of seahorses and other aquatic creatures, as these findings may offer clues about how climate change will impact species’ behaviour and survival in the future. Much has been learned about H. kelloggi, but many things remain to be uncovered. Great seahorses are also called Kellogg’s seahorse… which begs the question… is there a connection between Kellogg’s Frosted Flakes’ Tony the Tiger having the catchphrase “They’re Gr-r-reat” and this species being known as both the great seahorse and Kellogg’s seahorse? We may never know. One thing we do know is that great seahorses are a Vulnerable species according to the IUCN Red List, unlike many seahorses, which are Data Deficient. Speaking of names - Damaris Torres-Pulliza has snagged delightful shots of a variety of fish with particularly fanciful ones. These include the toothbrush leatherjacket, the tasselsnout flathead and the thornback cowfish. See some of Damaris’ other iNaturalist pics. Read the scientific article: Harasti, D. 2017. Southwards range extension of the great seahorse (Hippocampus kelloggi Jordan & Snyder, 1901) in Australia. Journal of Applied Ichthyology 33(5), 1018-1020.